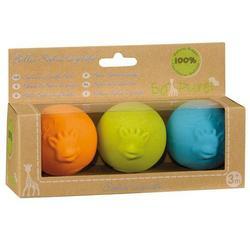 The first prehension balls ideal for stimulating your babys grip! Light and easy to grasp, your baby will enjoy manipulating and throwing them. Your baby will have fun discovering the raised head of Sophie the giraffe on each ball and this will help to develop his or her sense of touch.